Mountaineering (including hillwalking, climbing and rambling) is an activity with a danger of personal injury or death. Participants should be aware of and accept these risks. People who take part in our Club activities do so at their own risk and are responsible for their own actions and involvement. If you apply to join the Club you agree that you wish to take part in the activities despite these risks. The Club does not insure members or committee members and does not carry its own public liability insurance. Members should consider obtaining their own insurance and/or should consider the insurance that they can rely upon by virtue of their membership of Mountaineering Ireland. Glenwalk is affiliated to Mountaineering Ireland, which is the national governing body for the hillwalking and mountaineering in Ireland. When members join Glenwalk they also join Mountaineering Ireland and have a separate contract and relationship with Mountaineering Ireland. A leader is a member appointed by the Club to organise and manage a walk on behalf of the Club. All Leaders are volunteers and should be respected as such. The leader has the right to refuse anyone who is not adequately equipped or anyone who, in the leader’s opinion, is unfit to walk from joining that walk and they make that decision on behalf of the Club. All members have a duty of responsibility towards the leader and the group as a whole. This means that each member must not do anything to undermine the authority of the leader or the safety of the group. Listen carefully to the walk start announcements and description of walk choices on offer. If in doubt, err on the side of caution. It is irresponsible to go on a walk if you are unwell or injured. If you are not in a fit enough condition to do a walk you should not take part. If you start a walk it is a representation to the Club that you are physically fit and there is no health or other reason why you should not participate in the walk that you have chosen. It is the responsibility of each walker to maintain the pace of the walk they have chosen. It is each member’s individual responsibility to ensure that he or she is adequately equipped having regards to the walk planned and also the environmental conditions i.e. sturdy boots with ankle support, raingear, hat, gloves, scarf, hot drink, etc. A walker is responsible for keeping their own property safe on a walk or travelling to a walk. All walkers should have a torch with a battery, a back-up battery and spare bulb. All walkers should have a whistle, which should be used to attract attention. Bear in mind that whistles can only be heard over a short distance. Important Note: Whistle: 6 blasts per minute in rapid succession indicates distress, 3 per minute to respond. All walkers should have a backpack with adequate food and drink for a day on the hills. It is recommended that walkers purchase an Ordnance Survey (OS) map Sheet 56 (laminated) of the Discovery Series, or similar map for Wicklow. It will be useful for finding the walk start. All walkers should learn how to read a 6 figure OS grid reference number. Most of the starting points for walks are given as grid references. All walkers should familiarise themselves with the weather forecast for the day of the walk. All walkers should bring a mobile phone with them. Phones should have “ICE” contacts with details of who to phone in the case of an emergency. Important Note: In an emergency a Text Message/SMS may get through where a phone call won’t. Any independent decision to leave the group (i.e. not a decision agreed to by the leader) is the walker’s own decision and the Club is not responsible for anything that happens to the walker upon leaving the group. A walker must leave the walk if requested to do so by the leader. If a walker wishes to stop (e.g. to put on leggings etc.) while the main group is walking they must inform the leader or back marker. The leader will then decide if it is necessary to stop the group. The Club encourages car pooling, both to protect the environment and also because parking at walk starts is often limited. Only in exceptional circumstances should a driver arrive at the walk start alone. When parking at designated car pooling points please have consideration for business premises in the vicinity. Glenwalk is always delighted to welcome new members. While most join based on word of mouth, it is understandable that sometimes a prospective member may want to have a trial walk before signing up. To arrange this, please email membership@glenwalk.com– the Membership Secretary will work with you to identify a suitable Sunday walk/date and give you the relevant details (car pool point, etc.). Before coming out with us we expect that you will have read our Guidelines for New Members and have appropriate hill-walking gear, particularly sturdy boots with ankle support. 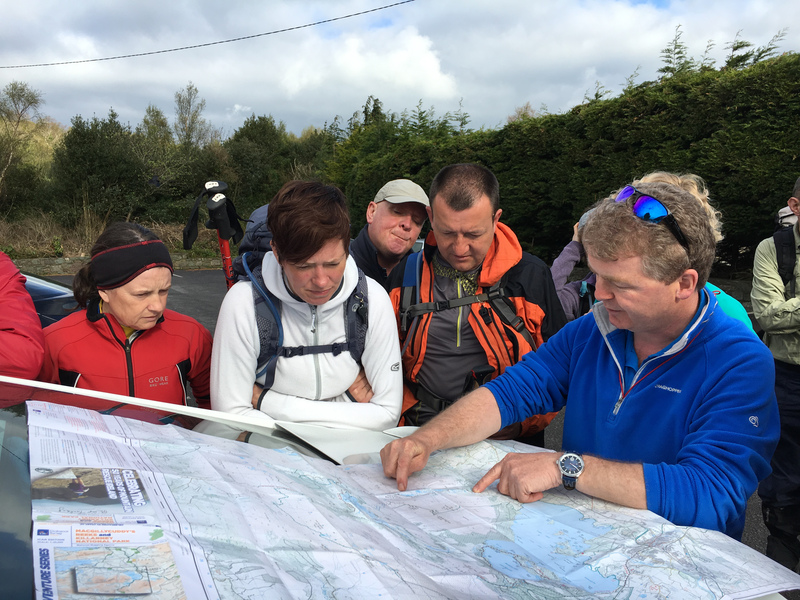 We are required by Mountaineering Ireland (who arrange our insurance) to record details of anyone availing of this option – you will need to link with the Walk’s Announcer on the day to complete an attendance sheet before heading out on the walk.